A Shoprite Hyper store in Mumbai. Mumbai / Bangalore: Anand Doraiswamy, a 28-year-old manager at Nivea India, is a regular shopper at the Shoprite store in one of Mumbai’s suburbs. “I definitely prefer it to the other stores close to my place. It has a nice international feel. The ambience is very good, very different from other stores. Because of their international way of stocking the store, I can find whatever I want easily," he said. Doraiswamy refuses to believe that Shoprite, the South African retail store chain, doesn’t own the store he shops in because of Indian laws that bar large overseas retail firms from selling directly to consumers. A Shoprite executive, J. Jhaveri, said company policy did not allow him to speak to the media. Analysts who do not wish to be named said the South African chain has a franchise agreement with Nirmal Lifestyle, an Indian mall developer, to run its stores, allowing it to use its name and technical expertise without owning equity in the company. Although India allows single-brand foreign retailers to own a majority controlling stake in their Indian subsidiaries, it allows foreign multi-brand retailers only in the cash-and-carry retail segment, which means they can sell only to smaller retailers, wholesalers, hotels and restaurants, not individuals. Metro is a cash-and-carry operation. At its store in Bangalore, access is restricted to those with a Karnataka sales tax (KST) registration. However, this means professionals such as doctors, lawyers or architects with a KST registration can actually shop at Metro. Prajwal, whose family has a Metro card acquired through her husband’s medical practice, shops regularly at Metro and finds it a convenient place to stock up on meat, fish, toned milk, cheese, snacks and bread. Her shopping list has nothing to do with buying for her husband’s medical practice. “I can pick up 4-litre packs of ice cream for Rs100 and Indian snacks like chaklis and kodubale in 3kg packs at half the price of what it costs at regular supermarkets," said Prajwal, who gave only one name. Executives in the industry and analysts claim such purchases by the so-called retail consumers could account for 30-40% of sales at Metro. Metro spokesperson Manish Bhargava said the company blocks and cancels cards of such customers. “We have a business-to-business relationship with our customers, so anyone who has a business licence to run a clinic, an IT company or a retail store can get a Metro membership, but the contract stipulates that they buy for the business and not for personal use," he added. Metro has more than 100 employees who regularly visit the company’s cardholders and track buying patterns. “Every month, cards that have been misused are blocked. We have revoked over a thousand cards since our launch in 2003," Bhargava said. Sales could taper off at cash-and-carry stores as more hypermarkets offering similar services to end consumers come up in the city, according to Raman Mangalorkar, who heads the retail practice at AT Kearney, a management consulting company. The owner of a small retail outlet, who did not wish to be identified, said she was a regular visitor to Metro in its first year and bought “household stuff". Now, she added, she gets the same products “easily at other supermarkets such as Food World or Big Bazaar that have opened close to my home". Still, the very fact that the system can be abused means that current policy can be worked around and needs to be rethought, said activisits. “Cash-and-carry is just a camouflage for entering the retail trade through the backdoor," said Chandrakant Sanghvi, chairman of the foreign trade committee of the Federation of Associations of Maharashtra, a retailer group opposed to organized retail. Foreign or Indian, it makes little difference to customers, though. 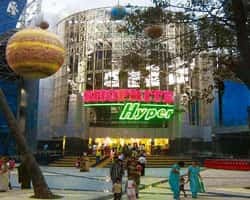 The Shoprite Hyper store in Mumbai’s Nirmal Lifestyle mall is filled with families making small purchases with a wide range of brands being offered in one shop. It is no different from other retail stores run by Indian firms and is open to everyone. Shoprite did not respond to queries on what model of stores it is permitted to operate in India. Neither the firm’s headquarters in South Africa, nor its Indian partner responded to emails and phone calls. Careful legal agreements may have allowed Shoprite to provide the same experience and popularize its brand seen in any of the 17 African countries it is in, according to lawyers. “What is prohibited is foreign direct investment in retail and they are not doing that," said a New Delhi-based lawyer who works with foreign companies seeking to enter India. “This is pure brand name use and there is no prohibition on that,"added the lawyer who did not want to be named because of the controversy surrounding organized retail in India. This arrangement makes Shoprite an Indian chain store, which can do anything an Indian store can. Daniel Rufus, who works in the cargo handling business, often shops at the Shoprite at Mumbai suburb Mulund. “It does seem like a foreign store to me. It is no different from the stores I shop at abroad," he said. The cash-and-carry and the licence route could be used by foreign retailers for an early entry to secure a toehold in the market in anticipation of deregulation. Their brands, as well as supply chains, would be established by then. Wal-Mart, the world’s largest retailer, has signed up with the Bharti Group, which owns India’s largest mobile phone network, to open cash-and-carry stores, as it gets ready to tap into a growing market. Ruetveij Pandya, senior associate (corporate and securities group) at Nishith Desai Associates, a Mumbai-based law firm, said that in licensing arrangements, “at the end of the day the front-end store is an Indian store with a licence from the foreign retailer to use its name and technical knowhow. Foreign retailers cannot own equity in Indian retail, so this is the second-best option". The government’s logic of restricting multi-brand foreign retailers to cash-and-carry operations was to protect kirana store owners. However, companies such as Reliance Industries Ltd, India’s largest private firm, and the Future Group, which owns the Pantaloon chain, are busy rolling out stores, big and small, in Indian cities. Widespread fear that some of these companies will eat into the tiny family-run businesses that have become the lifeline for consumers in Indian neighbourhoods, has stoked protests against organized retail. Shops of Reliance have been vandalized and some states such as Uttar Pradesh have barred large companies for operating food and grocery stores. The growth of organized retail, in India’s largely unorganized retail sector, would threaten as many as 12 million small retailers, activists said. The government has commissioned a study by a think tank, the Indian Council for Research on International Economic Relations, on the impact of organized retail on unorganized retailers, so that it can revisit its existing policy. People in the organized retail business admitted that the policy could do with some simplification. “It is hard anywhere in the world to keep separate rules for wholesale and retail businesses. Either foreign retail should be allowed in both or not be allowed in both," said R. Subramanian, managing director of Subhiksha Trading Services, which runs a chain of local discount neighbourhood stores.